Note:not all Smart phone and tablet under Android system have gyroscope chip in itself, if not, then it must be support OTG. At present, due to the limitations of connection APP, Jailbreak IOS or root Android is necessary, PC can use directly. 1. 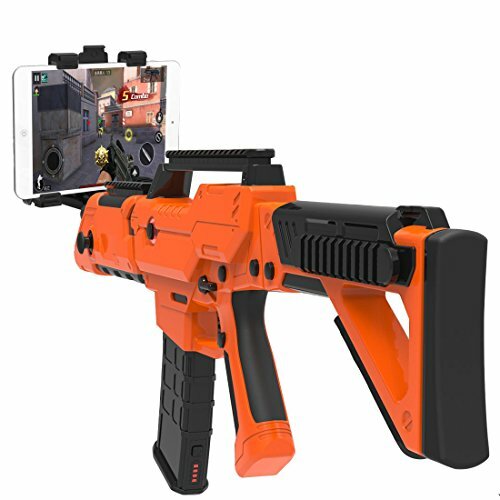 It is the first rifle shape FPS game controller for smartphone , tablet and VR in the world. And the size of any part, the recoil force experience make you feel like a real warrior. 2. You can change view by turning your body, aim the target by moving the gun, shoot by pulling the trigger, then you will feel the gun is shocked, and slight recoil force to your shoulder. 3. It has 10 functions keys and one joystick with 5 buttons, they can related to 15 functions in the game. Besides, you also can change the key to the function in the game by yourself. 4. PP Gun is compatible with IOS and Android systems via Bluetooth 4.0. It support all FPS games under Android, while support all FPS games with gyroscope mode under IOS. 5. The battery pack looks like clip of a rifle, and the capacity is 7800mAh, you can use it for 2 hours. Besides, it can be used as a power bank with two USB sockets, then you can charger any devices with it.